This documentary about spoken word performance and poetry in Washington, DC links the prevalence of these art forms among the African American community with a strong oral tradition. The film features prominent poets and demonstrates the process they use to strengthen their craft and prepare for performances. 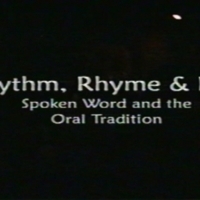 Chaytor, David Kehinde, “Rhythm, Rhyme & Life: Spoken Word and the Oral Tradition,” DC Digital Museum, accessed April 22, 2019, https://wdchumanities.org/dcdm/items/show/1526.